Roads are plowed and sanded according to the Snow Management Plan. Different areas have different priority zones, which are based on transit, school bus and emergency vehicle routes. During a snowfall, crews will keep plowing the highest priority zones to ensure main roads are clear before moving on to other areas. We closely monitor weather reports so the crew is ready for significant snowfalls. The workday starts at 6 a.m., but can begin much earlier depending on the weather. 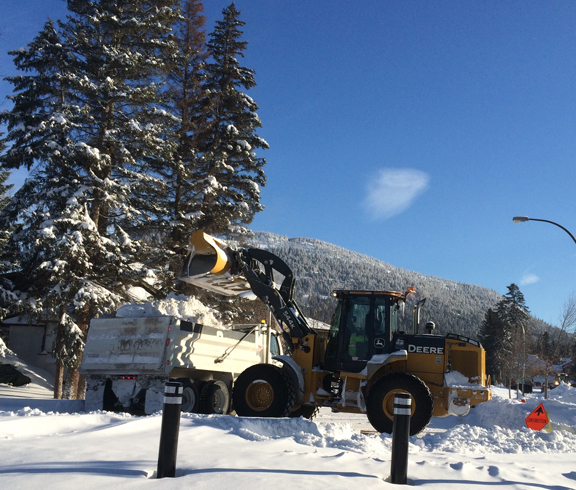 We have three sanders – two with plows – and one grader. We hire trucks to haul away snow when necessary. We stockpile 540 metric tonnes of a sand/gravel mixture at the Operations compound. We don’t use salt on the roads. It’s corrosive to vehicles and our infrastructure. It’s also harmful to the environment. We don’t clear roads to bare pavement. Our goal is to maintain a laneway wide enough for vehicles to safely pass. Plowing takes precedence over any snow removal. In fact, accumulated snow is only removed when it of a safety or drainage problem. Parking lanes are not cleared during snow events. A crew is standing by 24/7, but can only be called out by the supervisor or RCMP. In residential areas, crews will post ‘no parking’ signs a few days ahead of a planned snow removal. Please help us out, and move your car, or risk a ticket and towing. If you notice an intersection, crosswalk or road that needs more ice control, report the location online through an Action Request or call 403.762.1240. 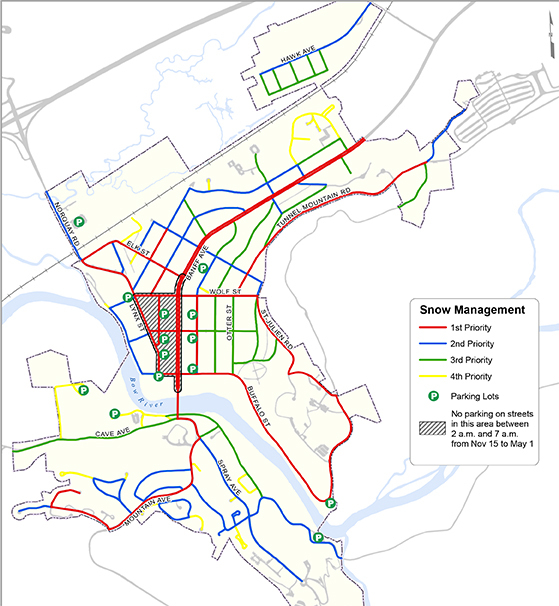 All Town of Banff roads are plowed based on a priority system outlined in the Town’s Snow Management Map (PDF). Road maintenance is done seven days a week throughout the winter season. Response during and after a snowfall involves snow plowing a driving lane and sanding. Priority 1 is plowed within 24 hours of a snowfall; Priority 2 is plowed within 24 hours of a snowfall, or after Priority 1 is completed to satisfactory condition. 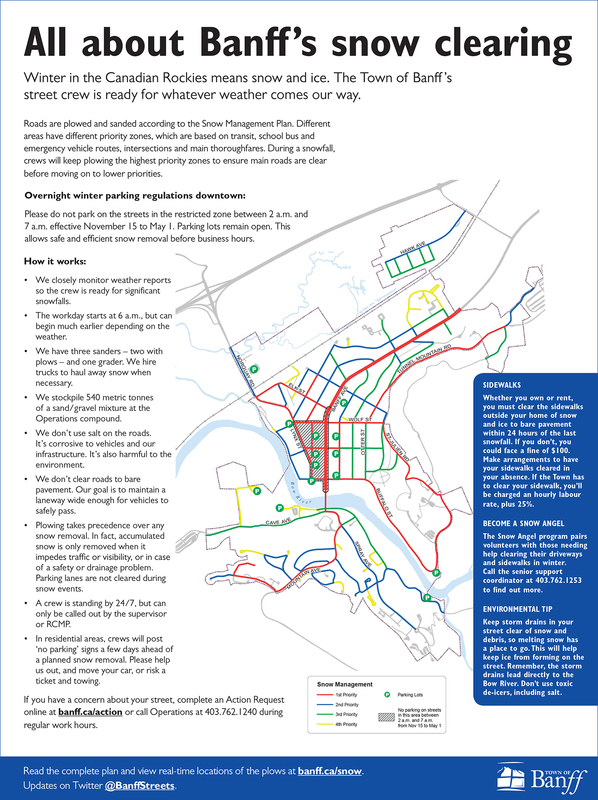 There are overnight winter parking regulations in the downtown core. Please do not park in the restricted zone between 2 - 7 a.m. This allows safe and efficient snow removal before business hours. Sidewalks: Adjacent to municipal property, paved and unpaved trails, municipal stairways (e.g Tatanga stairs), the gazebo and areas around public washrooms are maintained by the town according to the priority system. Property owners are responsible for clearing public sidewalks along their property lines. Failure to clear sidewalks could result in a $100 fine. Find out more about the responsibility of property owners to clear sidewalks. The Town will post temporary 'no parking' signs on streets to work on snow removal. Town bylaws allow for the removal of cars in temporary no parking zones after 24 hours. If cars were parked there prior to the no parking signs going up, it would be at the expense of the Town. But cars parked in those zones after signs go could be subject to a fine or towing. Most Town of Banff snow management vehicles are equipped with GPS sensors which report their current location and speed. This information is updated every 10 minutes on the Town of Banff Snow Management Map so you can see where vehicles are currently located, as well as where they've been over the past 6 hours. Staff also post live field updates to the map letting the public know when and where snow removal work will be done. Open the map in a new window. Follow the Town of Banff's streets department on Twitter for road updates @BanffStreets.